So what I am getting at is I don't really think that "First Comes Love.." applies anymore. I want to come up with something more about just day to day or the life of us or something....and I my creative juices have hit a road block. 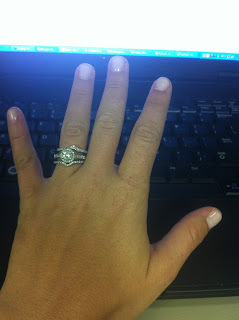 In the mean time, check out my nails...I finally tried the gel manicure last night....and so far, I LOVE it! I got a natural color.... I wanted a pretty fall color, but we are going to Mexico, but I didn't want too summery....so I went neutral....which will go good with a tan! :) If it lasts as long as it is suppose to...I will be hooked! Thumbs up for the gel manicure! Mine lasted almost 2 weeks with zero chipping! on the blog name... I'm in the same boat with wanting to change mine but not being able to come up with anything better... I actually really like "First Comes Love..." and think that it still applies! I think I'd be a tad heartbroken if you changed the name of your blog! I adore the creativeness in the name as is! "First comes Love, then comes marriage, then comes everything else" is totally relevant because you did state: "then comes everything else" although, like you mentioned, I am just a fellow blogger in "bloggy-land" and if you feel that you need a "fresh start," then by all means go for it! Try something perhaps along the lines of "Once upon a Ramble" or maybe "Loving Me, You, and Us" not sure if I helped but good luck and best wishes!